There was a lot of ado about the Golden State Warriors and if they could flip the proverbial “switch” in the playoffs following a pedestrian regular season. 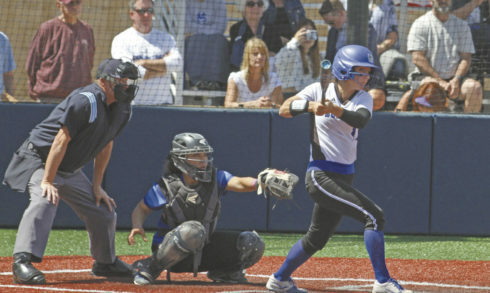 The College of San Mateo softball team was in a similar position Friday as the top-seeded Bulldogs opened Northern California regional playoffs against visiting Solano, the No. 16 seed. Unlike the Warriors, the Bulldogs kept the pedal to the metal throughout the regular season, recapturing the Coast Conference North Division championship. But could CSM simply carry its regular-season dominance right into the playoffs? Turns out they can. The Bulldogs scored early and often, while starting pitcher Emily McAdams was nearly unhittable as CSM roared out of the playoff gate with a 10-1, five-inning, mercy-rule victory. Game 2 of the best-of-three series continues at noon Saturday at CSM. If necessary, a third game would be played at 2 p.m. The way the Bulldogs played Friday, Solano is in for an uphill battle. Borg was pleased to see her team jump out to an early lead and then continue to add on. CSM (36-4 overall) scored two runs in each of the first two innings, added three more in the third and rounded out the scoring with two runs in the fourth as the Bulldogs scored 10 runs on 10 hits. “It was nice to see a steady balance (of offense throughout the game),” Borg said. “Usually, when you jump on a team that early, you take your foot off the gas. 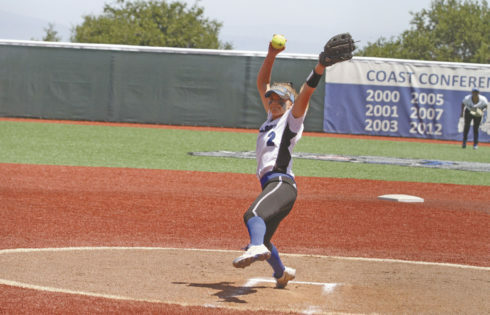 That was more than enough offense for McAdams, who has developed into a legitimate ace for the Bulldogs in just her first year out of Sequoia High School. McAdams worked the first four innings, allowing just one run on two hits before Lauren Quirke finished up the fifth. The sophomore loaded the bases with one out, but got a strikeout and flyout to center to end things. McAdams was perfect through the first three innings. She got out of the first inning on just five pitches and retired the first nine batters she faced. Falcons’ leadoff hitter Santiaga Ortega blasted a shot to the fence in center field that Emily Cotla could not track down to break up the perfecto bid. With Ortega on second, Alexa Vavricka came through with a two-out single to drive in Solano’s only run of the game. CSM knows exactly what Borg wants them to do at the plate and that is to bang the ball around the yard. As a team, the Bulldogs hit for the cycle — with Ally Sarabia supplying the homer and Allie Stines adding the triple. Stines, Quirke and Aubrie Businger each had doubles for the Bulldogs. This entry was posted on Monday, May 7th, 2018 and is filed under Athletics, Softball. You can follow any responses to this entry through RSS 2.0. You can leave a response, or trackback from your own site.